Everyone could use more time. Streamlining day-to-day processes opens up your schedule for more time, which allows for more work to be done in the day. In short, doing what you do each day faster allows for more things to get done. 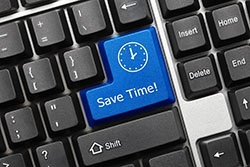 At Mortech, we understand how valuable time is for the users of our mortgage pricing engine. That’s why we’re constantly creating and updating tools that allow for more streamlined workflows and improved daily operations that give our users more times to focus on their prospects and closing loans. Curious about how we can help? Take a look at the calculator below, which calculates how much time a lender can save re-pricing loans through Marksman, as opposed to doing so manually. Of course, this is just one of many ways that Mortech saves our users time. Want to find out more? Talk with us today about how you can begin utilizing these features, and start giving yourself back time in the day to get more done.